A Practical Introduction to Reference Sources, Skills and Procedures for Library Students and Staff. This combination textbook/workbook provides an introduction to reference work by covering the theory and principles of good reference service, major reference sources in both print and electronic formats, basic reference skills and procedures. It reviews all the major types of reference sources, including dictionaries, encyclopedias, fast facts, biographical services, geographical services, bibliographies and library catalogs, directories, indexes and abstracts, government documents, and the Internet. After completing the practice exercises, readers should have a good understanding of a variety of current reference tools and an introduction to the types of questions each is designed to answer. Also included are plentiful, clear explanations and examples; a glossary with simple definitions of technical terms; a bibliography; and an index. 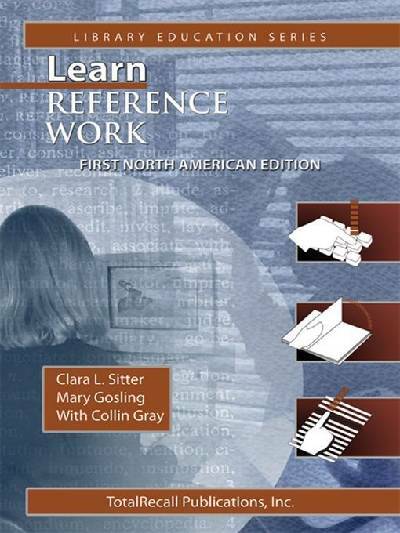 Learn Reference Work is one of nine study guides in the Library Education Series. Please see the back of this book for a complete listing, or visit www.totalrecallpress.com for more information. Clara L. Sitter is an appointed Associate Clinical Professor in the University of Denver, College of Education, Library and Information Science program. She has more than 30 years of professional library experience, including 18 years in academic libraries and 17 years in private and public school libraries, as well as experience in special and public libraries. She has been responsible for most aspects of library service, including reference, instruction, collection42 management, cataloging, and administration. Her areas of teaching are organization of information, understanding the information user, collection management, management of information organizations, and reference. Mary Gosling is a reference librarian and library educator who has taught reference and basic library skills for many years. She has been coordinator of the Library Studies Program at the Canberra Institute of Technology and is now a senior reference librarian and manager at the National Library of Australia. As a library educator, Mary has taught a variety of subjects, including reference skills, reader education and information literacy. Colin Gray has worked as a reference librarian, children's librarian, and manager of public services for many years. He has taught most of the subjects in college library technician programs, specializing in reference and public services. He has written teachers' guides, student learning material and curricula.